Please tell us now to choke our worst fears: Do bad pun-based jokes expire within 17 years? Mount Crumpet, Pontuse -- Hairy green lawyer Newton Grinch sparked controversy when he remarked on Seuss TV that the citizens of Whoville to the south of his cave were "invented people". "Oh, it is true, from the tall to the small, every Who down in Whoville is no Whovillian at all!" Explaining in a long, rhyming monologue about how much the Whos' cheerfulness and holiday celebrations for the past several decades annoyed him, Mr. Grinch insisted that he was well within his rights to put a stop to it all. He cited the May 16th, 1954 case of Horton v. Nool in which the court of the Jungle of Nool ruled in favor of the Sour Kangaroo against Horton the Elephant's claim that a speck of dust contained a microscopic civilization known as 'Whoville' with an inalienable right to life. "No need to check the details, my case is airtight," said Mr. Grinch. "My historical knowledge rarely fails. I'm never not right!" He finally closed his argument with a small Santa Clause: "With the facts on the table, the conclusion comes quick: The Whos are as legally existent as old Saint Nick. And with their current occupation not being their own land, I can take hold of their Christmas right into MY hands!" 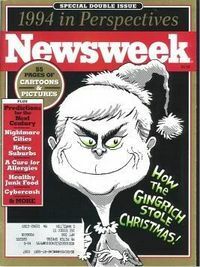 Mr. Grinch then made a giant smile accompanied with bent eyebrows, to which he assured was not the smile of an evil scheme being hatched, but that of holding back of a mix of laughter and guilt when a random "conniving Jew" joke suddenly pops into one's head. This page was last edited on 5 June 2012, at 06:00.